This is the strip detector test setup in room 342, which uses LHCb electronics. Inside the test box, there is the strip detector being tested (connected to a Beetle readout chip), a beta source and a photomultiplier tube, used as a trigger. When a beta passes through the detector and hits the PMT, the TELL1 system reads out the signal from the Beetle, and sends the data to the control PC. LHCb sofware is used to allow the user to receive and store the TELL1 data (the Event Builder) and then decode and process the data (Vetra). There is also an environment chamber, which can also be used to cool the detectors during testing. There are various Word documents available, describing how to use the system. Also, this page contains the LHCb software used with the setup, along with scripts needed to use the software. 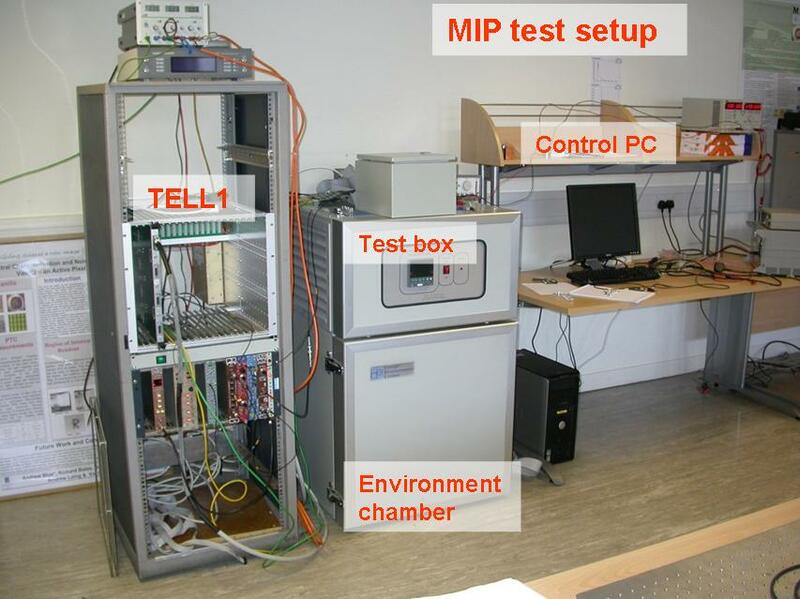 MIP_testing_introduction_and_hardware_setup.doc - This gives an overview of how the whole test setup works, followed by a schematic and photos of the test setup. MIP_testing_Software_installation.doc - If a new user wants to run the test setup from their own login, or analyse the data files later, they need a local copy of the Event Builder and Vetra software. The software - and appropriate scripts - are available further down this page. MIP_testing_step_by_step.doc - Step-by-step guide to using the test setup for various tests - finding the Beetle pulse shape, taking a spectrum once the peak time of the pulse has been found, doing noise tests. MIP_testing_Event_builder_and_CCPC.doc - Information and troubleshooting for the Event Builder and the Credit-Card sized PC built into the TELL1. (By connecting to the CCPC from the main PC, you can control the TELL1 and program the Beetle chips.) If you've used the system before, note that there is now a new, simpler and much less buggy Event Builder, using standard C++ rather than full LHCb software. MIP_testing_Vetra_user_guide.doc - Decoding and analysing the data from MIP tests using the Vetra software. After running the system, we end up with root files containing the output data. The Vetra ROOT Scripts page has various example scripts for analysing these files. ebuildZip.tar.gz - Code for C++ event builder. This is already available on ppepc28, so this isn't essential. EBuilder_Gla_Sept08.tgz - LHCb Event builder software (compressed tar file). This is the more complicated and buggy event builder, which you probably won't need; it's included here for completeness.